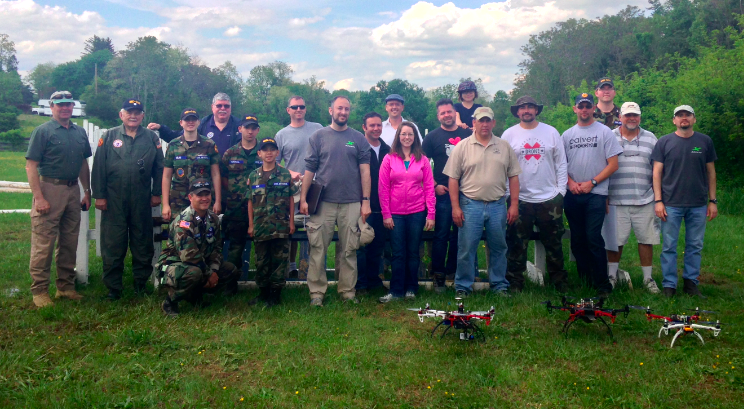 I had the pleasure of helping co-organize the first UAV/Drone Search and Rescue Challenge in the DC Area last Saturday. This was the first time that members of the DC Area Drone User Group participated in an event like this, so it was an ideal opportunity for everyone involved to better understand how UAVs might be used in a real world emergency to support of professional first responders. 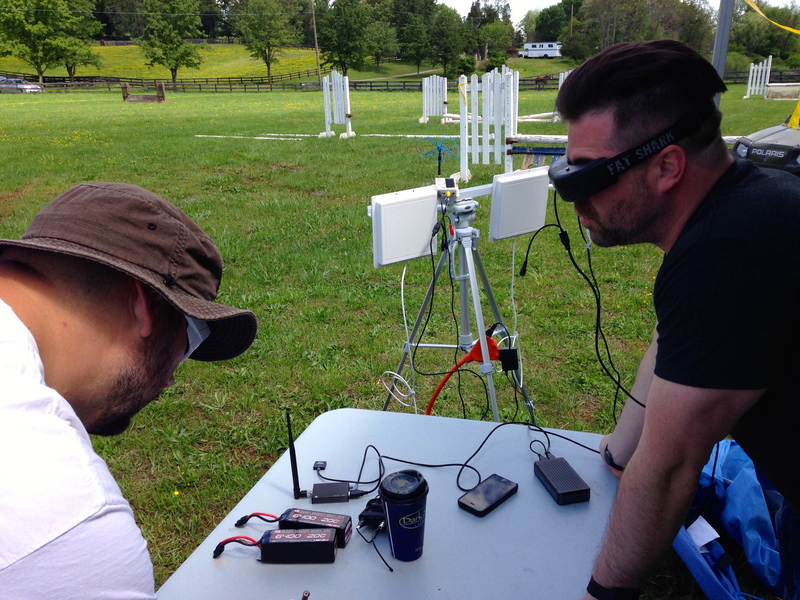 The challenge was held at the 65-acre MadCap Farm in The Plains, Virginia. For perspective, 65 acres is equal to about 30 full-size football (soccer) fields. 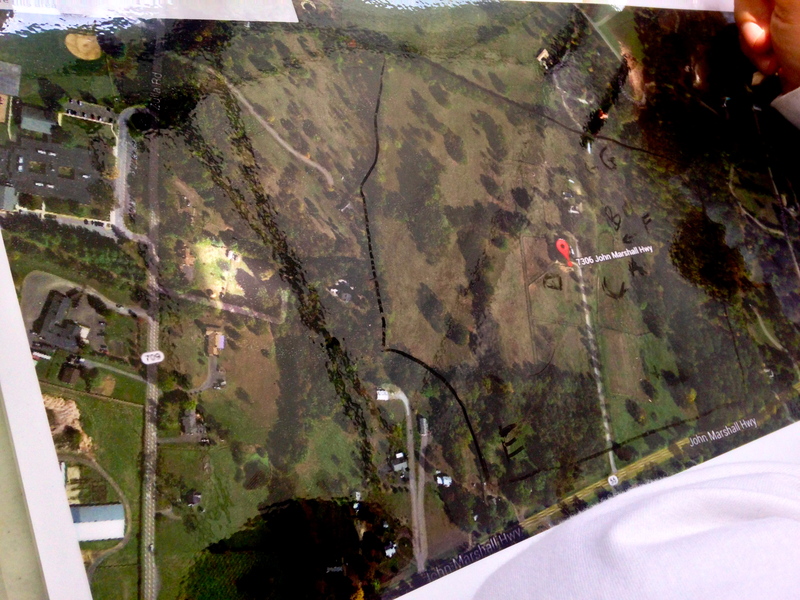 Satellite view of MadCap Farm above versus aerial view below during the UAV Search and Rescue Challenge. 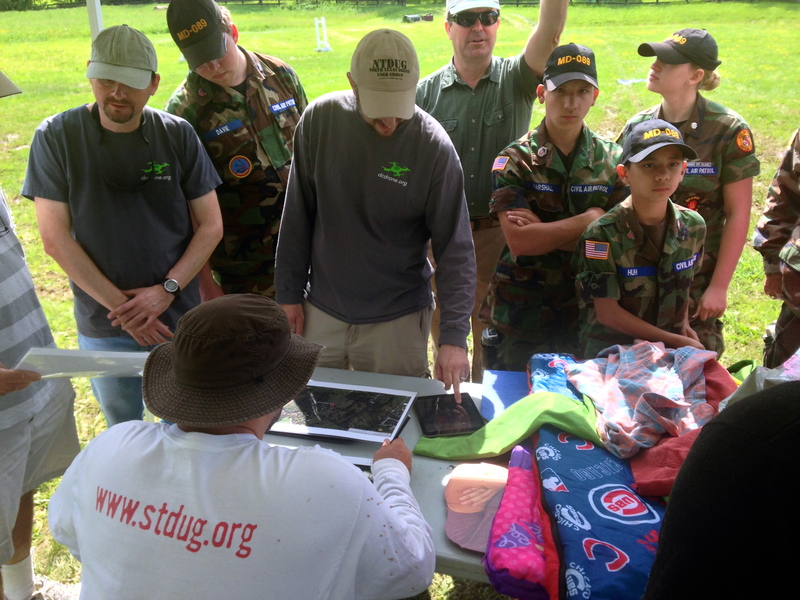 Upon reporting to the farm the following morning, the teams (pictured above) were notified that the campers were teenagers who were carrying sleeping bags and tents. 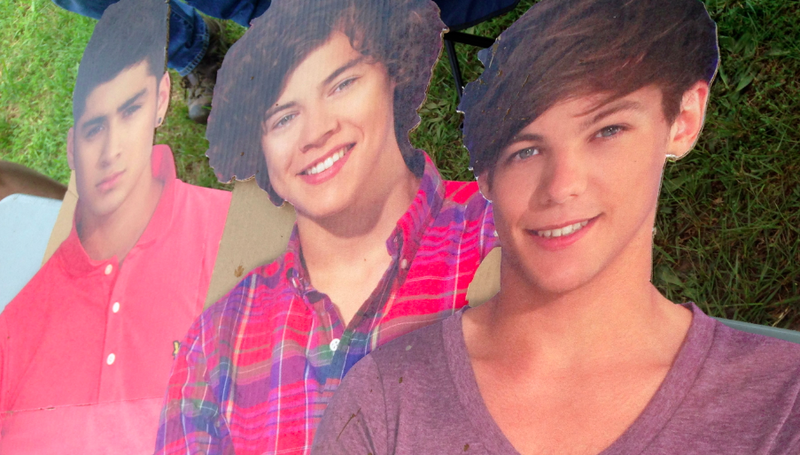 In reality, our three lost campers were the cardboard stand-ups below, but Timothy had already hidden these and scattered their belongings by the time participants arrived at the farm. By the way, notice all the clouds in the picture above? This would have hampered efforts to use satellite imagery in the search and rescue efforts. UAVs, in contrast, fly below the cloud canopy and can provide far cheaper and more up-to-date imagery at far higher spatial resolutions and available even using the best commercial satellites. As a side note, I was really pleased to see the Civilian Air Patrol (CAP) at the Search and Rescue Challenge. 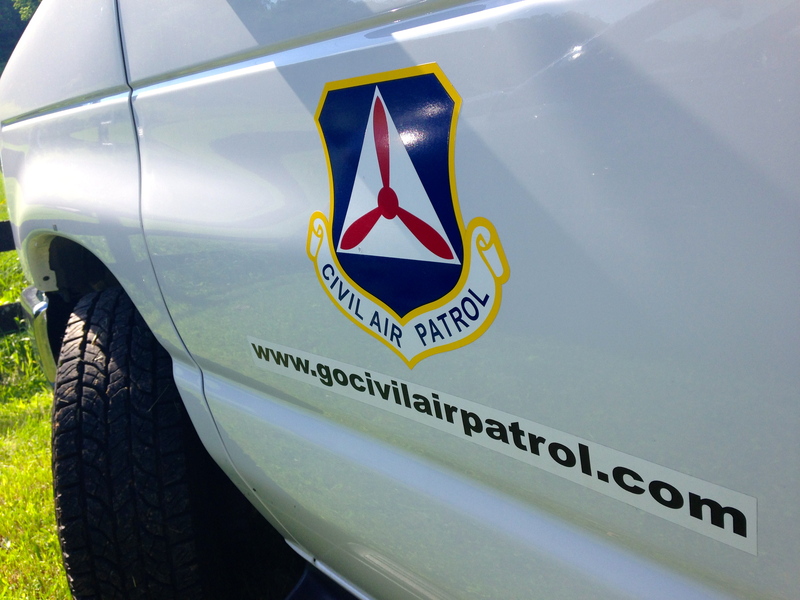 The Air Patrol is a federally supported non-profit volunteer-based organization that serves as the official civilian auxiliary of the US Air Force. CAP members share a passion for aviation and come from all backgrounds and walks of life. Back to the Challenge. 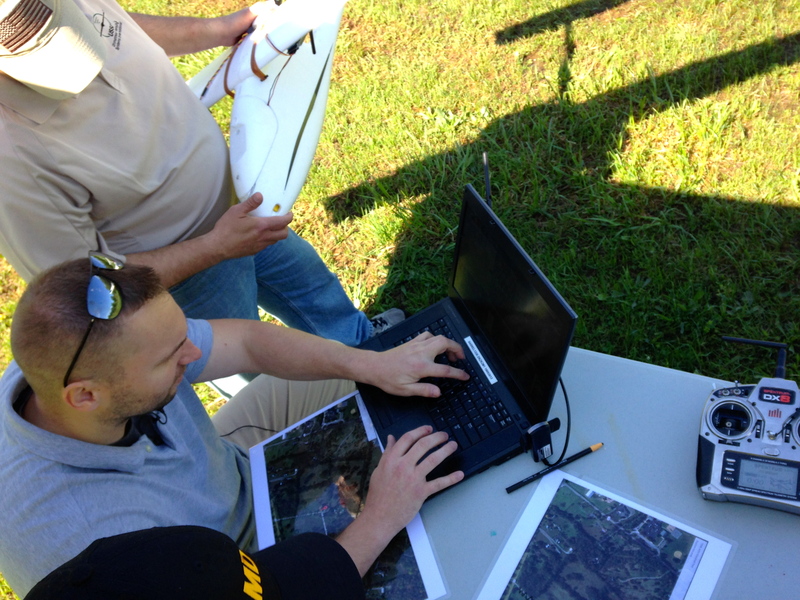 Each team had an hour to fly their UAVs and another hour to search through their aerial videos and/or images post-flight. 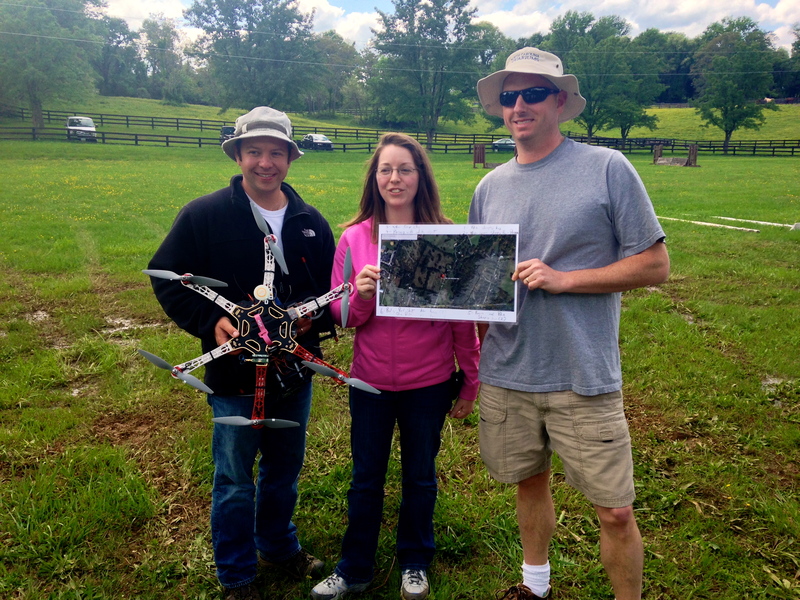 Two of the five teams used fixed-wing UAVs, like the group below, which kicked off our Search & Rescue Challenge. They decided to program their UAV for autonomous flight. You can see the flight path below with specified altitude and the different way points (numbers) in the top-right screen (click to enlarge). Here’s a short 20-second video of the hand-held launch of the fixed-wing UAV. Once airborne, the team simply switches to auto-pilot and the UAV does the rest, accurately following the pre-programmed flight path. The team decided to analyze their streaming aerial video in real-time, as you can observe in the second video below. While this certainly expedites the analysis and the search for the missing campers, it is also challenging since the team has to pivot back and forth between the live video and the flight path of the UAV in order to pin-point the location of a potential camper or their tent. Unlike rotary-wing UAVs, fixed-wing UAVs obviously cannot hover over one area but need to circle back to fly over the same area. My colleague Michael and his co-pilot programmed a quadcopter to fly to designated waypoints at a specified altitude. They too used live-streaming to look for clues that could reveal the location of the three missing campers. But they also recorded the video-feed for later analysis, which proved far more effective at identifying said clues. 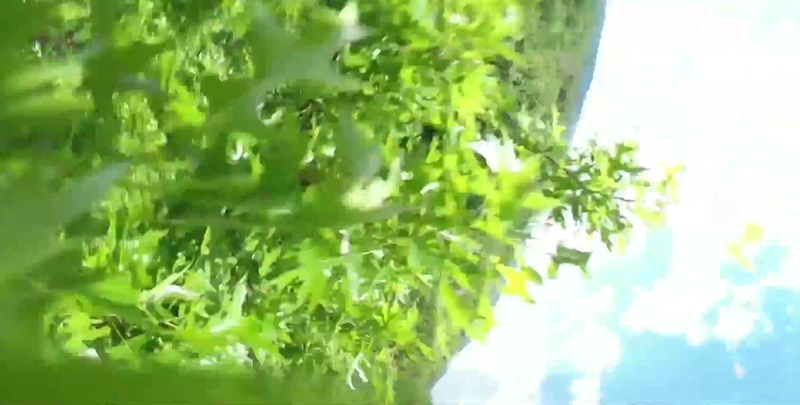 In any event, they used First Person View (FPV) goggles to see exactly what the quadcopter’s camera was seeing, as depicted below. In addition to searching for the whereabouts of the missing campers, Timothy and I decided to add a bit more focus on the “rescue” part of Search & Rescue. My colleague Euan kindly gave us a number of his new payload units, which are basically a pair of magnets that can be demagnetized by passing a small electric current through said magnets, thus acting as a release mechanism. Euan posted this short video of his prototype payload units in action during a first test earlier this year. Competing teams could earn additional points if they were able to carry a small payload (of their choice) and release this near any of the cardboard stand-ups they could find. Some teams used Euan’s units while other used their own, like the device pictured above. Here’s a short video of payload release (with parachute) during the competition. At the end of the competition, we all came together for a full debrief and of course to count up points. Timothy asked each team to share what they felt went well and what some of the major challenges were. The picture below shows some of the items (sleeping bags, clothing, etc.) that were scattered around the farm. Perhaps the single biggest challenge was altitude. 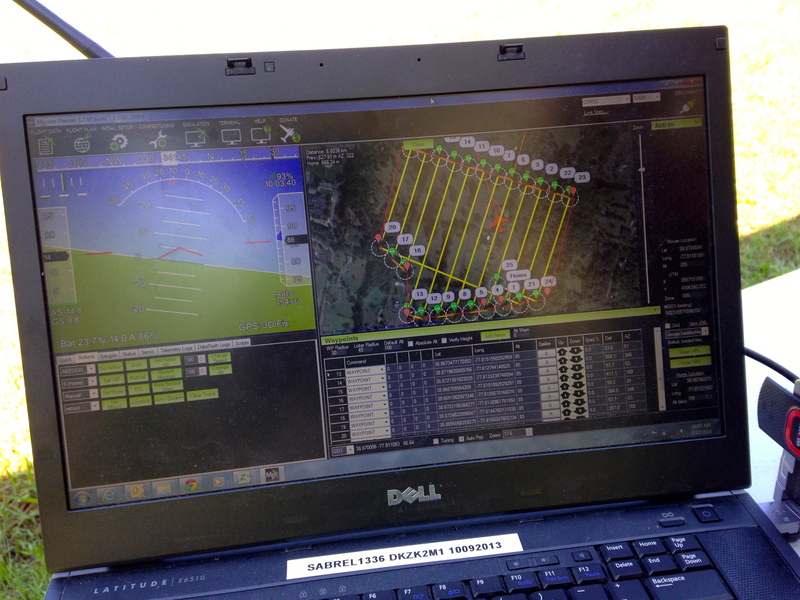 Given that we were in a valley surrounded by rolling hills, it was difficult for competing teams to judge at what altitude their UAVs should be programmed to fly since we couldn’t see over the next hill to determine whether there were taller trees in the distance. Flying too high would make it more difficult to identify the potential campers on the ground while flying too low would mean running into trees. Unfortunately, two teams encountered the latter problem but both UAVs were eventually recovered. This highlights the importance of developing automatic collision avoidance systems (ACAS) specifically for UAVs. In addition, if UAVs are to be used for Search and Rescue efforts in forested areas, it would pay to have a back-up quadcopter to rescue any UAVs caught in taller trees. One could attach a hanger to said quadcopter to unhook UAVs out of trees. 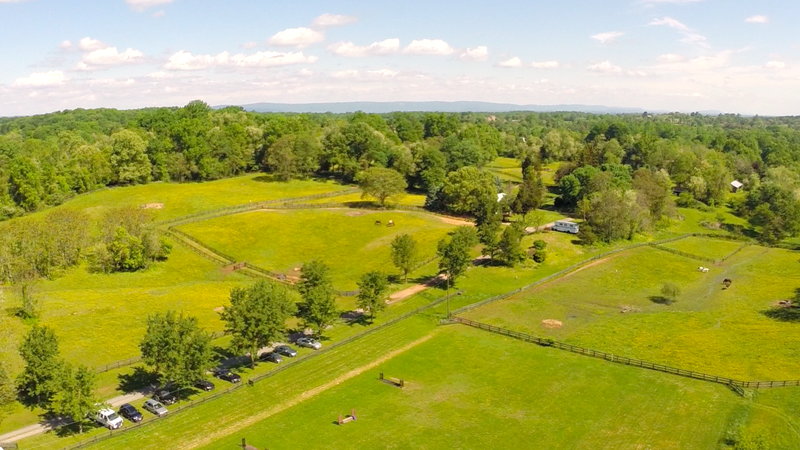 The picture below is taken by a camera fixed to a quadcopter that hit the top of a tree. Yes, we all had a good laugh about the irony of sending UAVs to rescue other UAVs. The debrief also revealed that most teams were able to find more items post-flight after going through their recorded video footage. My colleague Michael noted that finding signs of the campers was “like looking for a needle in a haystack.” One team noted that live video feeds have a limited range, which hampered their efforts. Another team remarked that one can never have enough batteries on hand. Indeed, wind conditions can very easily affect the endurance of UAV batteries, for example. The importance of pre-flight check-lists was reiterated as well as clearly spelling out safety protocols before a challenge. 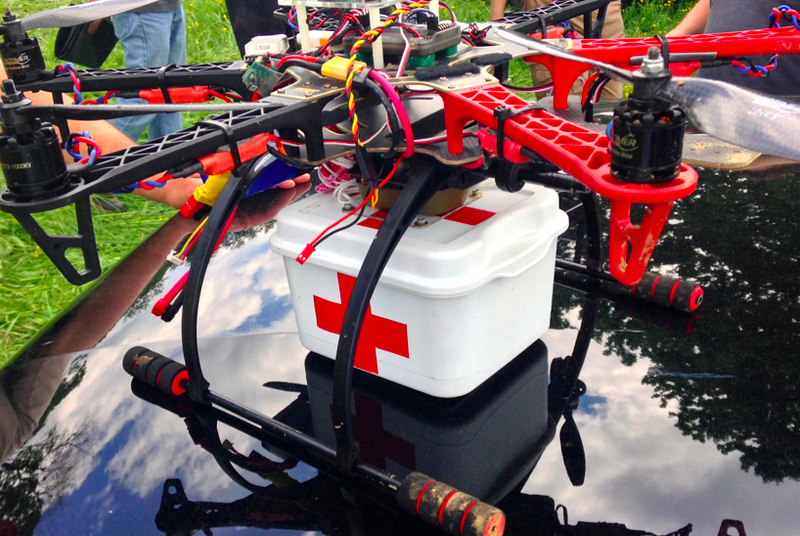 I’ll be sharing this debrief and lessons learned with my humanitarian colleagues at the United Nations and the Red Cross; as well as with members of the Advisory Board of the Humanitarian UAV Network (UAViators). Keep in mind that groups like UNICEF, UNHCR and the UN Office for the Coordination for Humanitarian Affairs (OCHA) have not yet begun to experiment hands-on with UAVs to support their relief efforts, so all of the above will be very new to them, just as it was to most teams who participated in the challenge. So this kind of hands-on learning will be of interest to humanitarians groups looking to explore this space. We counted up the points from each team’s map (like the one above) after the debrief and congratulated the winning team pictured below. They were the only team that found all three missing campers along with some of their belongings. Big thanks again to our hosts at MadCap Farm, to Timothy Reuter and all participants for spending a fun Saturday outdoors trying something new. We certainly learned some valuable lessons and in the process made new friends. The short video above was produced by CCTV America, a news television channel that reported on the Search & Rescue Challenge. Acknowledgements: Many thanks to Timothy Reuter and Michael Ender for their feedback on an earlier draft of this blog post. This entry was posted in Drones/UAVs, Humanitarian Technologies and tagged Challenge, Rescue, Search. Bookmark the permalink. For finding the needle in the haystick (in a SAR context) it would be very helpful using a thermal camera instead of optical photo or video. Would be interesting to investigate how the thermal sensitivity of COTS products decrease with flight altitude which would help with the trees. this is really cool. As a long time ham i have participated in many emergency management situations. it would be really interesting to incorporate my sUAV into these situations. Thanks, am a big fan of the outback challenge and recently watched that documentary earlier this year.